Solar Oven Sun Trackers...First run in the sun. 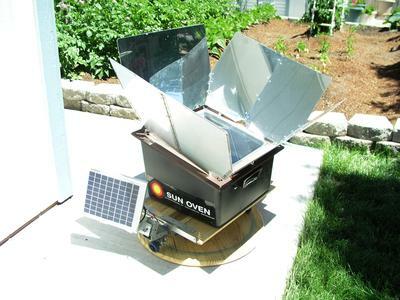 Finally finished working on my first solar tracker for a Sun Oven and IT WORKS GREAT! The objective was to make a light weight, sturdy and most importantly low cost sun tracker in order to optimize the oven temperature. The project cost just under $50, but it should make cooking a little easier. Using a 5W solar panel, a low geared DC motor, and a little bit of lumber, I was able to complete the rest with what I had on hand or salvaged from other projects. This was my first attempt and I know it looks a bit crude, but I already have another design in mind on the next one for our other oven. It should be much easier to build. Thank you for the update and for the persistent effort to bring to fruition a device that many solar cooks would like to have. There are days when it would be great to not have to worry about the solar cooker being able to function to its full potential due to inability at times of not being able to track the oven to the sun as frequently as one would like. In other words, being able to just let it go for extended periods and not have to be there. I would find this especially useful when the wintertime sun is more limited during the short winter days. Comments for Solar Oven Sun Trackers...First run in the sun. Very cool! What type of mechanism does your tracker use to follow the sun? I use my Sun Oven at least once or twice a week, especially in the summer. Wifey likes the fact that she doesn't have to turn on the kitchen oven because she knows it saves some money on electricity and it doesn't heat up the house. I'm not lazy, just forgetful about moving the sun oven every so often and no, I'm not going to carry around a timer to remind me it needs turned. If we decide to go somewhere for a short trip to do errands or maybe go for a bike ride or whatever, the first thing I have to do when we get back is to rotate the oven. The alternative to a failure in the sun oven is cold bologna sandwiches for dinner. On my next tracker I'll try to keep closer tabs on what the parts and expenses are in case anyone wants to give it a try. In response to the motor question,... I tried several different ones from old tools and toys I thought might work, but they were either too fast or required more power than a 5W solar panel could provide. I was trying to stay away from using batteries. I found this one on Amazon for $14 and the shipping was free. Look for Hossen 30 RPM mini gearbox electric motor. It's a 12DC 37mm high torque motor and it is definitely high torque. The tricky part is is adapting a wheel onto the shaft. It has a flat so I jammed a headless nail in the wheel shaft to secure it. Then I did a test run on the platform with a 30 lb weight and ran it with the solar panel for several hours. The blue tracks on the lower platform are from tire wear of that testing. Bravo James! I've been toying with this for years and finally a unit that makes sense. Where did you get the low gear DC motor? Or did you gear it down yourself? I usually have to move mine a couple times so this does it for you. very nice.